Journalist Tom Peele told reporters that more layoffs are expected. Last Thursday was a normal day for the East Bay Times' staff: On the transportation beat, Erin Baldassari had an eyebrow-raising story about racial inequality and car insurance rates. Courts reporter Angela Ruggiero wrote about Home Depot's $27.8 million fine for illegally dumping hazardous waste into local landfills. Investigative reporter Thomas Peele and crime reporter Nate Gartrell published a shocking clip about alleged police corruption in Kensington. Gartrell and Matthias Gafni followed up on a previous report about the Contra Costa County sheriff banning activists from the county's jails. 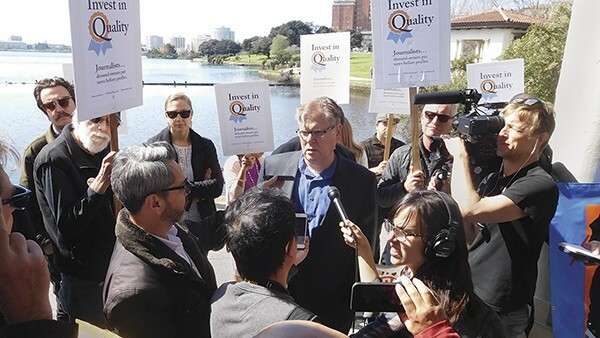 And Gafni and Oakland reporter David DeBolt went live with yet another piece about the Trump administration's attacks against Oakland's mayor. All of it was news, thoroughly reported, the kind you only get from a local newspaper with that essential combination of hungry, young reporters and experienced journalists, all of them incessantly digging and questioning and writing. But then at noon, the Times' staff got up from their desks and walked across Grand Avenue toward Lake Merritt. (Last year, Digital First Media, the Denver-based parent company of the paper, relinquished its downtown Oakland office lease in a belt-tightening measure and moved the staff into an older building.) The East Bay Times' staffers, along with reporters at their sister paper, the Mercury News, had issued a press release the day before. In response, a handful of reporters from other media outlets were waiting for them by the lake's edge. With their colleagues in a huddle, microphones and cameras reaching forward, Peele, who was among the Times' team that won the Pulitzer Prize for breaking news last year, read from a prepared a statement. Just a few weeks before, the Times and Merc were hit with damaging buyouts and layoffs. Combined, they lost their last K-12 education reporter, health reporter, multiple writers covering smaller cities from Palo Alto to Richmond, several photographers and editors, and administrative staff. Back in 2000, the papers that now make up the Bay Area News Group had about 1,000 editorial employees across 16 regional newspapers, but the majority worked at the Merc and the now defunct Oakland Tribune and Contra Costa Times, which were combined in 2016 into the generically named East Bay Times. According to Bay Area News Group Executive Editor Neil Chase, the Times, Merc, and the smaller papers in the BANG family had shrunk to a combined staff of 150 just before this year's buyouts and layoffs. Multiple newsroom sources pegged the number of jobs eliminated in 2018 at 50 — a third of BANG's total editorial staff. In a region already lacking print media firepower, the cuts left gaping holes in coverage. A couple of the organization's reporters later told the Express that their newsroom has taken on the feel of a funeral parlor because of the all-too-frequent goodbye parties. "Layoffs continue to this day, with more to come," said a dour Peele at the press conference. The handful of Times and Merc reporters who have managed to survive several years of demoralizing squeezes nodded in agreement. While Peele spoke, another reporter handed out a fact sheet about the "pillaging" of the Bay Area publications. It included a comic depicting a business executive trying to squeeze milk from an emaciated cow. "Dude! I'd produce more milk if you fed me!" complained the dying beast. "We understand that a business needs to make profit, and we also acknowledge the challenges facing the news industry," continued Peele. More nods. But Peele went on to say the broader industry trends that have cost newspapers revenue over the past two decades are not to blame for the recent cuts at the Times and Merc. In fact, Peele, and hundreds of journalists who work at other Digital First Media papers, say they're profitable. "It's just not been profitable enough to Alden Global Capital," said Peele. Alden Global Capital, a Cayman Islands tax-sheltered hedge fund run out of offices in New York City, began gobbling up newspapers in 2009. Through its majority stake in Digital First Media, Alden now owns the Times and Merc along with other major dailies like the Orange County Register and Denver Post. DFM also just bought the Boston Herald. The result is that Alden controls a significant chunk of the nation's local newspaper industry. Alden's power represents a different, financialized-era for print journalism. In the past, papers were typically owned by a single family, a small group of local investors, or a traditional corporation primarily in the business of journalism and the advertising that supports it. These kinds of owners had a stake in the regions where they had print media, and flawed as they were, they supported beat reporting in the name of accountability. Alden, on the other hand, is purely in the business of maximizing profits. According to its own registration records with the U.S. Securities and Exchange Commission, Alden zeroes in on chaos and destruction in global markets to squeeze maximum value from anything it can buy. Even within its own industry, it's been referred to as a "vulture fund," because it buys cheap, distressed companies and claims and then tries, at all costs, to extract more value than thought possible. That often means painful things for the companies — even nation states — that Alden targets. "Alden seeks to capitalize on, among others, distressed situations, reorganizations, bankruptcy proceedings, liquidations, arbitrage opportunities, sovereigns, litigation, claims, liquidity crises, corporate spinoffs, tender offers, restructurings, weak corporate management, failed corporate strategies, operational missteps and inefficiencies, proxy fights, recapitalizations, temporary supply-demand imbalances, non-economic selling pressures and other extraordinary events," the hedge fund's executives explained in a regulatory filing with the SEC.